These are just a few of the media headlines lately involving tractor-trailer accidents in Virginia. In the North, and especially in Virginia, winter time is often beautiful and scenic. But with winter time, we also get winter weather (snow, sleet and ice) which unfortunately contributes to an increase in tractor-trailer accidents and more reports like those noted above. According to Virginia State Department of Motor Vehicles in December 2013 there were 10,960 crashes with 63 of the crashes fatal. 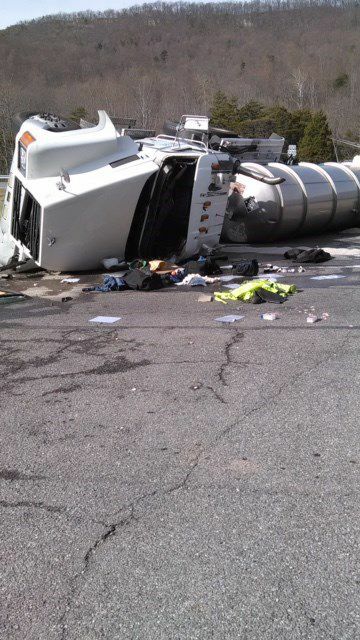 Of these 10,960 crashes, 4,623 invoived a commercial vehicle (tractor-trailer). 32 of these crashes were attributed to sleet and 144 were attibuted to snow. Driving safely and patiently while working to avoid an accident is the best way to keep you and your family safe. If you do find yourself or a family member involved in an accident, make sure you are all informed. Attorney Warren’s book entitled: A Crash Course in Virginia Automobile Injury Cases, is a great way to ensure that you protect your rights after any type of vehicle accident. To receive a free copy of the book, click the following link: A Crash Course in Virginia Automobile Injury Cases. Although The Warren Firm is located in Charlottesville, VA, Vaden Warren accepts and tries cases from all over Virginia, including Richmond, Louisa, Tappahannock, Lynchburg, and many other surrounding cities and towns. If you or a loved one has been involved in a Virginia car accident, please do not hesitate to give us a call at (434) 972-9090 or visit our website at The Warren Firm.